William Howley, Archbishop of Canterbury 1828-1848, led the Church of England during the beginning and expansion of the Oxford Movement, at a time when the precursor to the Church Commissioners was established, and during the momentous debates and decisions in Parliament which saw the final retreat from the myth of an all Anglican legislature. 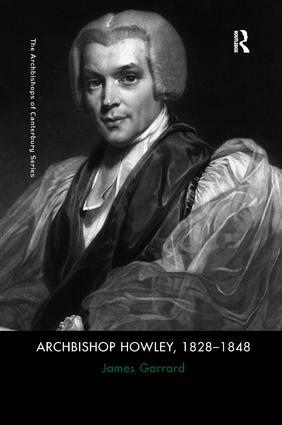 Howley’s chairmanship of the commissions of the 1830s and 1840s which began the gargantuan task of reforming the Church’s practices and re-arranging its finances, made him an object of fury and scorn to some of those who benefited from things as they were, most especially in the cathedrals. Exploring the central events and debates within the Church of England in the first half of the nineteenth century, this book draws on primary and secondary evidence about Howley’s career and influence. A section of original sources, including his Charges and other public documents, correspondence and speeches in the House of Lords, places Howley’s achievements in proper context and illustrates his prevailing concerns in education, the establishment and political reform, relationships with the Tractarians, and in the early stages of Church reform. Dealing thematically with many of the issues faced by Howley, and exploring his own High Church theological views in historical context, James Garrard offers a fruitful re-appraisal of the intellectual, spiritual and ’party’ context in which Howley moved. James Garrard is Canon Precentor of Ely. He was Denyer and Johnson Student of the University of Oxford from 1991-1992 and was awarded a doctorate in 1992 for a thesis on Archbishop Howley. He was ordained in 1994. He has published several articles and reviews in the areas of Church history and liturgy and contributed to the 3rd edition of the Oxford Dictionary of the Christian Church.